Abrom Kaplan Memorial Hospital has served Vermilion parish since 1958, specializing in acute care and healthcare to patients who would otherwise have to travel out of the area. The hospital provides healthcare services that include a 35-bed critical access, 24-hour emergency department, and more. The hospital has faithfully provided services to people living in the Kaplan and Vermillion Parish. 2002 – Abrom Kaplan Memorial Hospital partnered with Lafayette General Medical Center in its resolve to provide a higher standard of healthcare to its local community. The partnership contributes more resources and access to services that benefit the people of Kaplan and Vermilion Parish. 2015 – Pixus worked closely with Abrom Kaplan Memorial Hospital to design and produce standoff frameworks to celebrate its long history and culture. 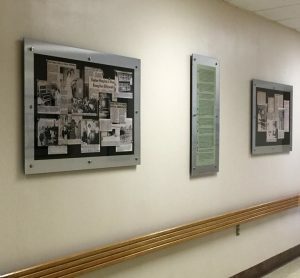 The project developed artwork designed to showcase the hospitals rich history, and can be seen displayed in the hospital’s hallways. Photos of this rich history were printed on high quality paper using the ultramodern swiss Q nyala flatbed printing system. 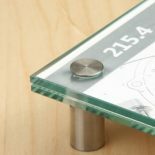 Photos are placed behind an acrylic finished substrate and enclosed with brushed metal frames. The frames are mounted using one inch brush metal stand-offs. The one inch stand-offs add a luxurious dimensional element to the product. While the frames offer the hospital an aesthetic showcase, they are reusable and photo changes are quick and easy. Tours of the Pixus Digital Printing facility are welcomed and available by appointment.